The new Icaro 2000 Skyrider PPG helmet (with optional clear visoricaro) is the result of years of research in the Powered Paragliding community. 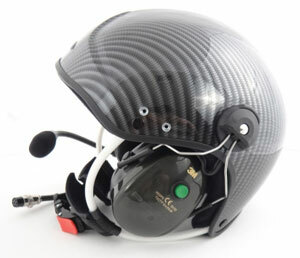 Icaro took the time to find out what pilots wanted in a communication helmet and this is the result. The combination of the quality of workmanship, materials used, great looks and affordable price will make this helmet the first choice among PPG pilots. A fresher look for 2007 - The Icaro 200 Skyrider fully certified polycarbonate technology open face PPG helmet. Peltor Optime II earcups with integrated NAC Intercom system, PTT on left earcup, noise canceling boom microphone, available for VHF 2 meter (Yaesu, Icom, etc.) and all FRS radios (Motorola, Cobra, etc.). Pearl White or Carbon Fiber colors. Price does not include visor. Fully certified CE certification - Helmet for Airborne Sports (EN 966), unlike other Radio-helmets in the U.S. market today which are not certified. Helmet is manufactured using Polycarbonate technology. Ultralight weight and stylish design. Available in carbon fiber optic color. Sizes - from S to XXL. Lining and padding - special anti-allergic - top quality materials to ensure comfortable fit and long lasting wear with excellent protection. Icaro 2000 Skyrider Basic PPG Helmet - Ideal low cost helmet for the pilot who does not need a communication system. Icaro 2000 Skyrider Standard Com Helmet - Peltor Optime II earcups with integrated NAC Intercom system, PTT on left earcup, noise canceling boom microphone, available for VHF 2 meter (Yaesu, Icom, etc.) and all FRS radios (Motorola, Cobra, etc.). Price does not include visor. Icaro 2000 Skyrider Deluxe Com Helmet - Peltor Optime II earcups with integrated NAC Intercom system, PTT on left earcup, noise canceling boom microphone with built-in sidetone, 5 mm. plug (RCA) to connect a music device like MP3 or CD player, available for VHF 2 meter (Yaesu, Icom, etc.) and all FRS radios (Motorola, Cobra, etc.). Price does not include visor. Please Order these helmets on our Miniplane-USA website.